Monitoring board effectiveness has been a recognised component of good corporate governance at German companies for many years, not only for listed entities but also for publicly-owned or family-run operations. For supervisory boards, good corporate governance involves an assessment of the board’s organisation, composition and function as a whole, as well as its committees and members. German law stipulates an institutional separation of management and supervision for listed companies (two-tier system). 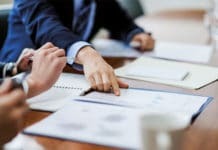 Executive boards (management boards) generally have more than one member and these individuals are collectively responsible for managing the company. The supervisory board is responsible for overseeing the work of the management board by monitoring and supervising the legality, propriety and expediency of the management. 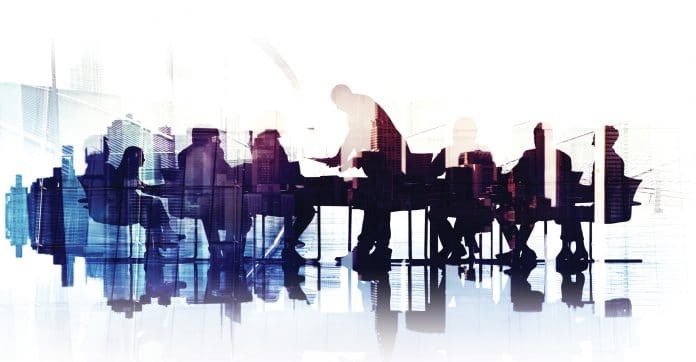 Supervisory boards are composed of mandatory non-executive members with, depending on the size of the company, up to a third or a half of the members being employee representatives in accordance with the German law on co-determination for companies with over 500 employees. 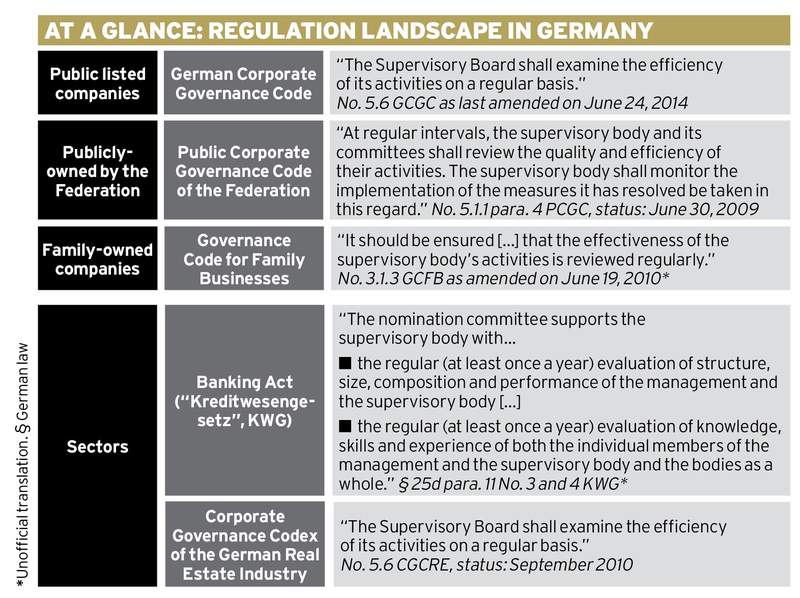 The German Corporate Governance Code (GCGC) specifies and complements German corporate law requirements comprising best practice guidelines of good corporate governance (soft law). Under the terms of the GCGC, management and supervisory boards have to declare annually whether the Code has been and is being observed and which of the Code’s recommendations have been or are not being applied and why – a comply-or-explain-principle. Regular evaluation of the supervisory board’s work is recommended in section 5.6 of the GCGC, which was introduced in 2002. In fact, although the GCGC addresses mainly listed companies it has significant spillover effects for other companies. Thus similar rules can also be found in the Public Corporate Governance Code for the Federation (PCGC) introduced in 2009 and in other public codes installed by German federal states or municipalities. Codes for family-owned businesses and sectoral specifics have evolved. Although board evaluation is not a legal requirement but only a recommendation for good corporate governance following the comply-or-explain-mechanism, it is already well accepted practice today. The rate of compliance among DAX30 blue-chip stock index companies is 100 per cent and 92.7 per cent for all listed companies (Berlin Center of Corporate Governance, Corporate Governance Report 2014). Compared to the figures from 2005 that disclose a compliance rate across all listed companies of 87 per cent (Berlin Center of Corporate Governance, Kodex Report 2005), acceptance is obviously increasing. These empirical findings show that board evaluation has become a proven tool in corporate practice to ensure targeted analysis and optimisation of supervisory board activities and is now a de facto seal of quality for good corporate oversight. But there is more to come: since the amendments to the Capital Requirements Directive (CRD IV) of the European Union came into force on 1 January 2014, there is now a legal obligation to conduct an annual evaluation of the activity and the members of the supervisory body and the management body in Germany. This law applies to credit and financial services institutions, financial holding companies, mixed financial holding companies and mixed companies, as well as financial companies (financial institutes). What does a board evaluation involve? The required board evaluation is generally performed as a self-evaluation by the supervisory board and is increasingly being performed at regular intervals (banks are required to perform the statutory evaluations on a yearly basis). It aims to assess factors such as the effectiveness and efficiency of supervisory board work in terms of both organisation and content. At the same time, the evaluation serves to review compliance with legal requirements as well as code recommendations and suggestions (for example, GCGC) relating to supervisory boards (compliance). Additionally, jointly reflecting on one’s own work provides the supervisory board with an opportunity to improve its processes and structures for the long term, as well as to strengthen the sense of community and motivation within the body. In addition to topics relating to supervisory board organisation, such as composition, bylaws and committees, and its activities – communication with the management board or between the plenum and the committees of the supervisory board, as well as preparation and execution of supervisory board meetings – the evaluation should include core elements of the supervisory board’s work, such as management board remuneration, corporate strategy and planning, financial reporting and corporate control systems. The evaluation should be based on a structured process that takes into account current demands on supervisory boards and supervisory board best practice. No two supervisory boards are exactly alike. This is why both the process and the content of the evaluation of board operations should be tailored to the board’s needs considering aspects specific to the company and the industry it operates in as well as the wider environment. The actual design of both aspects is then decided by the supervisory body itself. In practice, company-specific questionnaires are often used. Their advantages lie in the coverage of a wide range of subjects and the individual perception of each individual board member which proves to be an efficient approach due to the highly standardised and computer-based execution and the objectified comparability of findings within the supervisory board or in comparison to peers because of the scalable results. In addition, individual in-depth interviews are part of the established repertoire, especially when they complement the prior (written) questionnaires. Furthermore, board operations can also be evaluated using open panel debates of the full supervisory board and audit committees respectively. Depending on the size and desired extent of the evaluation, different methods, or some combination thereof, will be found to be the best choice. During the evaluation process the supervisory board can be supported by external consultants. As the EU-Green Book European Corporate Governance Framework (2011) states: “Regular use of an external facilitator […] could improve board evaluations by bringing an objective perspective […].” An external perspective is useful as benchmarking and best practice experiences are made available and allow the board to make comparisons to the operations of other companies’ bodies. Such experts can offer added value in the form ofadditional insights from the in-depth consideration of selected topics, the opportunity to confidentially address individual topics beyond the evaluation form and additional reliability through verbal validation. It is essential to understand that the external facilitator will not usually express their own opinion of the board’s effectiveness, but compares the self-perception of the board members to the self-perception that members of other similar supervisory bodies have of themselves – naturally keeping any information strictly anonymous and confidential in the process. Integrity and confidentiality are two of the most important criteria for selecting the right advisor. Because of the fact that board evaluations are not generally required by law and are the responsibility of each supervisory board, empirical evidence is still relatively rare. In an extensive study conducted in 2013, Rapp/Wolff confirm the high acceptance rates of the recommendation of the GCGC for the largest listed companies in Germany (DAX30, MDAX, SDAX, TecDAX): 96 per cent of the responding companies had performed a board evaluation in the last two years. 74 per cent of companies survey the work of their supervisory boards annually. An analysis of the annual reports of the companies from the DAX30, MDAX, SDAX and TecDAX by EY draws an equally positive picture of the prevalence and the regularity of board evaluation. However, below the level of listed companies, the picture is quite different, a view also confirmed by financial institutes. As an EY survey shows, although mandatory evaluation has been required since January 2014, only 27 per cent of all directors indicated that to the best of their knowledge a self-assessment of the supervisory body had actually been conducted in the year. However, this study also reveals that the questionnaire is the most frequent instrument used for evaluation. Rapp/Wolff’s study of German stock corporations reveals the same picture: evaluations (multiple choice) were primarily performed by questionnaire (81 per cent) or an open discussion in the plenum (71 per cent). The chairman largely determines how an evaluation is configured. In 75 per cent of the companies covered by the survey, the board evaluation is conducted due to the chairman’s initiative. Intensive participation of the plenum is restricted mainly to the discussion and evaluation of the results. Moreover, three quarters of the supervisory boards take a maximum of one hour to discuss the results. Given such a minimal approach, it is hardly surprising that the results are only glossed over. Only 30 per cent of companies drew on the assistance of external consultants. The focus of board evaluations lies primarily on cooperation with the auditor (stated as highly relevant by 88 per cent of the respondents) and the information supplied by the management board (87 per cent). As a general rule, the availability of suitable information for the supervisory board (concise and problem-oriented documents) is considered the most important basis for good surveillance yet the quality of the documents is only listed as highly relevant by 52 per cent of the respondents. Dealing with conflicts of interest (31 per cent) and the flow of information between the chairman of the supervisory board and the plenum (21 per cent) are also issues that, surprisingly, are are not frequently addressed with high relevance. 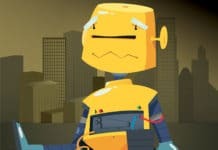 Board evaluation for compliance’s sake? Are there any other benefits of a board evaluation besides that of ensuring compliance with the law (in the case of financial institutes) or corporate governance code recommendations? ■ Open discussion and enhancing the effectiveness and efficiency of supervisory board work. ■ Increased transparency and improvement of communication within the supervisory board and with the management board. ■ Continuous improvement of supervisory board work, the motivation of board members and also changing their mindset regarding their responsibilities and team-work. ■ Documented basis for a release from liability. ■ Confirmation of compliance with regulatory requirements and an enhanced reputation on the capital market. From our experience with board evaluations the gravest pitfalls in a board’s effectiveness lie not in the lack of technical knowledge, but in organisational failures and also, in some cases, human weakness. A lot of work still needs to be done by many companies to successfully install the board evaluation process and realise the associated benefits. Moreover, the mindset of supervisory board members to the process needs to change. Nevertheless, the picture painted by the respondents gives cause for optimism: although only 23 per cent of supervisory board members assess the benefits of a board evaluation higher than the cost, at least 93 per cent believe that – in principle – an evaluation of efficiency and effectiveness is an appropriate instrument to improve the quality of the supervisory board’s work. However, almost half of the respondents believe that the evaluation is currently ineffective because no specific recommendations are derived from the evaluation. Discussing the results and tackling the specific issues that arise is naturally one of the key factors in the effectiveness of the board evaluation. But this is not the only critical success factor: a suitable evaluation method and a systematic identification of topics that might contain core issues are just as important. The choice of key topics needs to be tailored to the company and should take into account current regulatory developments as well as “sensitive“ and new issues in supervisory board practice, topics arising from the specific work of the supervisory board during the evaluation period, insights gained from the findings of past evaluations as well as topics addressed during the year by the “core” of the supervisory board or addressed by other stakeholders, where applicable. In addition to all the technical steps and issues, the most important factor is the open approach of each board member. Board members must express their opinion honestly and take a realistic and critical view of the board’s work and their own performance. This necessitates an environment of trust, which can be facilitated, for instance, in interviews with an external advisor. 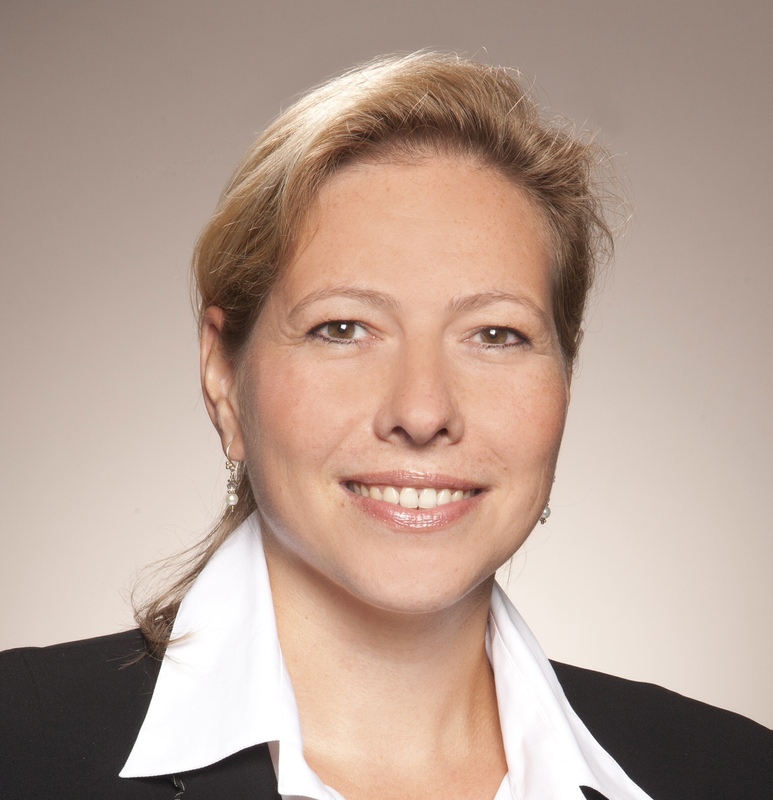 Daniela Mattheus has been an Executive Director at EY since July 2012 and is in charge of Corporate Governance Board Services in Germany, Austria and Switzerland. She leads the EY network for Corporate Governance & Regulation in EMEIA. In this role, she advises management and supervisory boards and is responsible for the EY Governance Matters®, the EY information and networking platform for board members and audit committees. Daniela Mattheus specialises in commercial and corporate law and corporate governance issues and has gathered excellent advisory expertise over more than 12 years of work supporting board and audit committee evaluations, in (non-)executive coaching and in monitoring the effectiveness of governance structures in large and medium size companies and their external corporate governance reporting. Prior to joining EY, she held a leading advisory function relating to this topic at another Big4 audit firm for several years. Alongside her work at EY, she is assistant lecturer at the law faculty of the Free University, Berlin and Ruprecht-Karls-University of Heidelberg as well as tutor in various executive education programs and author of numerous publications.